Sorry, it was actually a beautiful sunny day, late morning. We arrived at Houmas House in time for the 11:30 AM tour on a gorgeous mid-November morning. I had wanted to see this house since I was 10 years old after seeing the Bette Davis gothic suspense film, “Hush, Hush Sweet Charlotte,” co-starring Olivia deHaviland. If you haven’t seen it and like suspenseful movies, this is a definite must-see. My parents always insisted the house didn’t exist and was just a back lot at a Hollywood studio. However, nearly my entire life I remained convinced the house was real. When my husband told me he was taking me on a trip to New Orleans I was besides myself. Considered by many to be the paranormal capital of America, New Orleans had been on my “must visit” list practically my entire life. I was so excited. I began researching all the places I wanted to see so I could create our itinerary for our 4-day trip. At some point I remembered the movie and the house and wondered if it was anywhere in the area and open to the public. 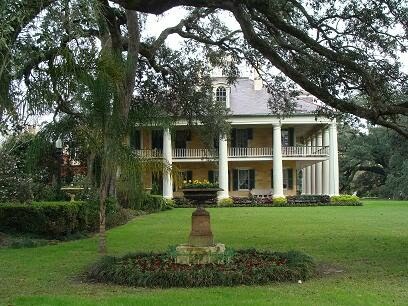 I googled “Hush, Hush Sweet Charlotte house” and Houmas House came up. I was thrilled to see that not only did the house actually exist, but it has a 32-acre garden, three restaurants, and the home itself is open to the public for tours. On our third day in New Orleans we undertook the hour drive to Houmas House. Through google I discovered the place is supposedly haunted by a little girl in a blue dress (no, I did not see her), but then again, aren’t all old plantation homes haunted? When you consider the tragedies of slavery their walls have witnessed, not to mention the Civil War (many homes were used as barracks or hospitals while soldiers fought in surrounding fields), and the Yellow Fever epidemic of the late 1800s, these homes have seen a great deal and it’s no surprise that a few ghosts still linger. I took this photo of the exterior of the home as we were leaving. Note the Spanish Moss hanging from the oak trees. How atmospheric!! As we entered Houmas House I sent out as strong a mental message as I could and kept repeating in my mind, “if there are any spirits here, please find a way to manifest in my pictures.” To be honest, I did not “sense” anything. Only once when we were walking the gardens afterwards (see below), but unfortunately I have no photographic evidence of what occurred. The house itself felt warm and inviting. The current owner, Kevin Kelly, had completely gutted and renovated the entire house back to its antebellum glory. He is an avid collector of antiques and has filled the house with furniture, light fixtures, fireplaces, musical instruments, games, and various other objects that all date back to the time of the Civil War. The home is absolutely beautiful and a must-see if you are ever in the area. Now on to Part 2, see my next entry.